LILONGWE, Sep 2 2011 (IPS) - For the last two weeks, Malawi’s president has been running the country’s 22 ministries on his own after firing his entire cabinet. But political and economic analysts say that his delay in appointing a new cabinet is detrimental to the country’s development. Some analysts say government has come to a standstill because of this, while others say the situation shows that the president has lost control. Malawi has been operating without a cabinet following an unprecedented move by the country’s President Bingu wa Mutharika to dissolve it on Aug. 19. It is not known when Mutharika will appoint a new cabinet. Hetherwick Ntaba, spokesman for Mutharika’s ruling Democratic People’s Party (DPP), told IPS that it is the president’s prerogative to dissolve the cabinet. “The president can appoint and remove ministers when he sees fit and that’s his right,” said Ntaba. He confirmed that Mutharika was heading all 22 ministries. However, the decision comes soon after unparalleled mass protests against Mutharika in July, where 20 people were killed by police. Among other things, demonstrators had demanded that Mutharika reduce the size of his cabinet, which had grown to 42 from 29 in 2004 when he assumed power. The protesters said the bloated cabinet’s monthly wages amounted to 100,000 dollars – money that could pay the monthly salaries of 428 nurses or 1,000 teachers. Up to 60 percent of Malawi’s 13.1 million people live below the poverty line. Noel Mbowela, a political analyst at Mzuzu University, told IPS that Mutharika probably fired his ministers because he lost trust in them. “He has taken too long to replace the cabinet and this only shows that he is having difficulties running the country and his own party. It is, however, unfortunate that he is holding the whole country to ransom and putting progress on hold while he is struggling with decisions on who to appoint to the cabinet next,” said Mbowela. He said Mutharika seems to have lost control governing the country for some time now and the unprecedented demonstrations only cemented this fact. “The president went on radio and asked Malawians why they doubted him. He knows he has lost control and he is really struggling to resolve that,” Mbowela told IPS. In June Mutharika addressed the country on state-controlled radio and pleaded with Malawi’s citizens to trust him, as he knew what he was doing. Malawians once lauded Mutharika for turning the Southern African country into the breadbasket of Africa thanks to his economic policies, which favoured small- scale farmers. Mustapha Hussein, a political analyst at the University of Malawi, told IPS that Mutharika is shortchanging the country. He added that government has come to a standstill because of the absence of ministers. “Policy formulation is now in the hands of one man – the president. He is not getting any advice at all and that is dangerous for the country’s development,” said Hussein. According to Malawi’s constitution, ministers are supposed to not only advise the president, but also direct, coordinate and supervise the activities of government departments, initiate bills for submission to parliament and formulate the budget of the state and its economic programmes. 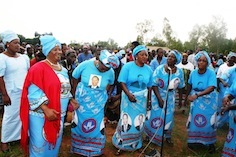 Mutharika is also at loggerheads with Vice-President Joyce Banda. He no longer works with her and refuses to assign her any duties. Last December he expelled Banda from the ruling party after accusing her of insubordination – that was the last time she worked as part of government. Banda had refused to endorse Mutharika’s brother, Peter, as the ruling party’s candidate for the 2014 presidential elections. She has since launched her own party but still remains the country’s vice- president. The office of the vice-president is an elected and constitutional office. However, Hussein hopes that Mutharika will appoint a new, leaner cabinet soon. “The country can’t afford to spend money on 42 ministers. The work they do can be done by a maximum of 15 cabinet ministers,” said Hussein. He said in the past the president had appointed certain people as ministers for political reasons. Economic analyst Dalitso Kubalasa, who heads the Malawi Economic Justice Network, a coalition of more than 100 civil society organisations that promote economic governance, agreed with Hussein. He also called for ministers to be appointed on merit and soon. “We hope the president is taking his time to appoint a new cabinet because he is consulting and choosing the right people. “The president needs assistance in resolving the social and economic turbulence that the country is going through,” said Kubalasa. Malawi is experiencing an economic downturn and faces fuel and water shortages, power outages and a lack of foreign exchange. The country’s relations with its traditional donors have also suffered greatly following accusations of bad governance. Up to 40 percent of Malawi’s national budget has been dependent on donors and 80 percent of the country’s development budget was provided under the Common Approach to Budget Support. This included contributions from Britain, Germany, the African Development Bank, Norway, the European Union and the World Bank. However, the British and German governments have refused to release up to 400 million dollars.